Recently, the first author had a chance to submit a technical note to some journal. The content of that manuscript addressed recent experiences and findings during many technical visits at natural disaster areas. The first author hereby use one part of the article for readers’ information concerning what is called the combined effect. The combined effect stands for a situation in which two or more disasters occur simultaneously or sequentially and aggravate the results. In one situation, the first disaster triggers the second one, while in other situations two or more disasters occur independently but the consequence of the second one is made worse by the effects of the first event. Because the former situation appears to be very rare, this article addresses the second type. Because of the nature of this bulletin, the content mainly concerns slope problems. The author made a technical investigation in 2005 immediately after the Kashmir earthquake. Among many slope failures in weathered surface materials, the situation in Fig. 1 was impressive in that the crack apparently provided a water channel into the subsoil. During a rainy season, the surface run-off water would easily flow into the slope and increase the weight of soil, reduce the effective stress, and possibly deteriorate the mechanical properties of the submerged soils. Thus, the negative effects of a heavy rain fall were made worse by the preceding strong earthquake shaking, which is herein called the combined effect. Fig. 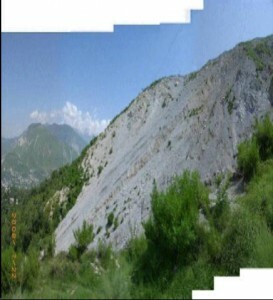 2 Continuous failure of mountain slope initiated by strong earthquake motion (in Muzaffarabad after the 2005 Kashmir earthquake). Fig. 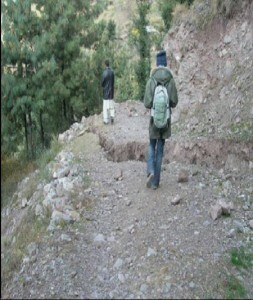 1 Earthquake-induced crack in mountain slope (after the 2005 Kashmir earthquake). It was peculiar that the same earthquake triggered a long-term slope failure in a mountain behind a local capital of Muzaffarabad City (Fig. 2). Possibly the mechanical properties of the rock was disturbed by strong shaking and minor cracks were created. Consequently, the continuous failure of the slope and falling of debris especially during heavy rains have been a significant threat to the local community. These cases described above illustrate a combined effect of earthquake and rainfall.